You probably need more supplies than you know. For this reason, we’ve created a simple checklist with links to our best recommendations in order to make this as painless as possible. We know figuring out what you need isn’t easy, so we’ve done the hard work for you on this page. We hope we’ve helped you in your pet bird supply hunting endeavor! Your comment may just help someone find something their bird would love! I have a dog he’s a doberman he is not aggressive to humans but at cats and birds. He is an outdoor dog and has lived peacefully with a hamster (until she died). Would it be okay if i had a lovebird inside? 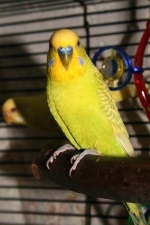 I currently have a pair of budgies and I am thinking of getting a cockatiel. I was wondering if I should have both birds out at the same time or should I let them out at different times. This is a great question. You should be able to safely let them out at the same time while supervised, but if they won’t be supervised, they should be let out separately. Hello. I’m thinking about getting a Cockatiel as soon as I can move into my new house and I’ve never had a bird before but I’ve been trying to research information for the past 3 years. One question I have that never gets answered is would it be a good idea to have 2 cages for a bird? I had been notified about bird’s normal routine of not defecating for a few hours and releasing a good amount of droppings in the morning and that birds also prefer not to defecate where they sleep so i had the idea of what if I had a cage that was slightly smaller for the Cockatiel to sleep in and a bigger cage for it to spend it’s day when I’m at classes or work? I planned on putting about 3 perches, still some food and water bowls and a cuttlebone in case it decides it would rather do something before sleeping, but I’m not sure about this until I can hear from someone. Thanks! A lot of small parrots enjoy having a swing. I have all those same questions, did any one ever answer you on another site? We care for and love many wild birds in our garden as well as 2 roaming indoor/outdoor cats and 1 lab who all cohabitat and get along. How we determine the cats and dogs wont stress the bird? Is the cage type/hieght as important as I think? As small parrot wants to be out of the cage so will that be an issue? You should not get a bird with a cat or dog. A lot of people do it, but unfortunately do not realise that no matter what, dogs and cats WILL stress your bird out. Dogs and cats are driven by PREY INSTINCT, and unfortunately they don’t understand that you see the bird as a friend, not food. Please take this into heavy consideration and think about this heavily before deciding to get a bird, as any bird you get, no matter what size, will be stressed out and saddened by the presence of a predator in it’s home (which may cause behavioural issues, such as feather plucking, biting, screaming, self-mutilation and increased night frights). If I were you, I’d stick to feeding the wild birds, maybe try attracting some wild crows/ravens, they can be pretty fun, friendly and interesting to hang around! I tell you this not to berate you or anything, this is a pretty common thing actually for new bird owners. I tell you this so you have all the information you need before getting a bird and to share my knowledge with you so that you don’t end up with an unhappy bird who bites you for no apparent reason. What if they will live in separate rooms? I have cats and dogs but do not like the dogs and none of them are allowed in my bedroom at any time. I used to have a cat who lived in my room only because she didn’t like the dogs, but she passed away this past summer and I’ve been very lonely. She preferred my room and didn’t mind not leaving it, and birds are much smaller so the room would seem even bigger to them but I’d hate to get a bird and just end up making the rest of its life really stressful. The dogs can get noisy when they get up in the morning or when someone stops by (but we probably have a visitor once a month), so I don’t want the barking to stress the bird out either. I know that is right in most cases but I have had some success with this! I have a 3 year old conure and a 18month old English staffy and they get on great. I lay on my bed with both and my conure (Gracie) climbs all over my dog and he just lays there. They cuddle and nap together regularly. Now don’t get me wrong I don’t leave them along together (not 100% by choice, if I get up they both have to follow me) and when I’m at work they are in there separate areas. But I think if a puppy is raised with the bird you shouldn’t have problems. i have a dachshund,(aka sausage dog), and a budgie. They love playing together all day. My bird certainly isn’t stressed around the dog. If anything, them being together makes the bird calmer. However, I did introduce them to each other when they were both young, so it was probably easier than other situations. We care for and love many wild birds in our garden as well as 2 roaming indoor/outdoor cats and 3 long hair chihuahuas who all cohabitat and get along. I had paraketts as a child and have always dreamed of a small parrot. How we determine the cats and dogs wont stress the bird? Is the cage type/hieght as important as I think? As small parrot wants to be out of the cage so will that be an issue? Im also able to have an outdoor cage, will this a good thing with so many wild bird? Appreciate any advice for a southern Ca birder. “You should not get a bird with a cat or dog. A lot of people do it, but unfortunately do not realise that no matter what, dogs and cats WILL stress your bird out. Dogs and cats are driven by PREY INSTINCT, and unfortunately they don’t understand that you see the bird as a friend, not food. Please take this into heavy consideration and think about this heavily before deciding to get a bird, as any bird you get, no matter what size, will be stressed out and saddened by the presence of a predator in it’s home (which may cause behavioural issues, such as feather plucking, biting, screaming, self-mutilation and increased night frights). If I were you, I’d stick to feeding the wild birds, maybe try attracting some wild crows/ravens, they can be pretty fun, friendly and interesting to hang around! Also, please do not think for a second that your chihuahuas will be harmless to a bird, they can kill and eat birds, if you do get a bird, you should lock your chihuahua’s away so that it cannot get to the bird until you put it back in it’s cage.